Q1: Today’s announcement, can you explain to us the significance of the Kabwe transaction announced earlier? A1: The Kabwe transaction follows on negotiations we announced to our shareholders late last year. Jubilee informed our shareholders that following on from the success we’re having in South Africa on our platinum chrome strategy, that we looked to diversify our company into other mining jurisdictions and Zambia being noted as being one of the key targets. Zambia is a known mining jurisdiction, especially in the copper, cobalt, lead and zinc area, and we’re very happy that we’ve been successful in transforming that into a binding shareholder agreement and operating agreement for the company. So, it takes Jubilee into the Zambian jurisdiction, it takes it into a project that has significant resource at its surface and it also takes us into base metals; lead, zinc and vanadium, all very topical metals at the moment in the world of energy, in the world of batteries, in the world of electrical cars. So, very very pleased that we were able to successfully implement these agreements. Q2: What are the key terms of the agreements? A2: It’s interesting the terms, what we’ve negotiated, of course, is that Jubilee Metals Group will fund the mutual development of the project, of this Kabwe project, and in doing so will farm-in to a position of initially 40% into the project. What makes the funding attractive for us is that the funding is in the form of project loans which are repayable, and these loans enjoy a preferential status is that they are highest ranked. So, our loan will be repaid by the Kabwe project before any evidence of assets are declared out of the project so we farm-in on the loan and that loan gets repaid. If the project requires any further funding, beyond our initial project loan funding, its shareholder of the project being ourselves at 40% and BMR the remaining 60% of the project, its shareholder will then fund proportional funding. If a shareholder is unable to fund its portion, the other shareholder may invest the funds and of course, dilute the other party. So, all in all, very attractive terms for Jubilee. Also, very importantly Jubilee is appointed as the operator of the project, what that means is we have the obligation to determine and then define the business model and then to implement that business model through our subsidiary which is now appointed. 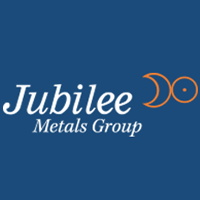 Q3: What are the immediate next steps for the project for Jubilee Metals? A3: Well, our immediate next step is we are completing that business plan, which is required under the agreement and that business plan is then sent into the Zambian authorities for approval and all that must be done before 15th June when we then trigger the acceleration of the construction of that plant. In the meanwhile, of course, we are already commencing with test works and site preparation works at Kabwe as we are starting up and preparing for the execution of that project. It’s a busy time as we align various engineering groups and also ensure that Zambian authority and government is fully aligned with our business plan and also approves the implementation of our business plan at Kabwe. It’s a very exciting project, it’s a large project, in Zambian terms we are pursuing 6.5 million tonnes of material at surface containing a lot of lead, zinc and vanadium.